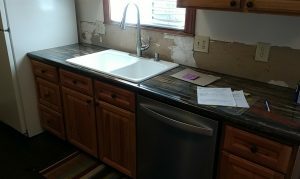 The old tile counter top edge was coming off and missing in spots. New tops are plastic laminate. New full tile backsplash is being done by the homeowner. White are the new cabinets! 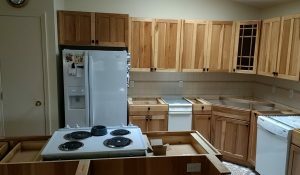 This home owner wanted taller cabinets for more storage and the layout was changed a little. 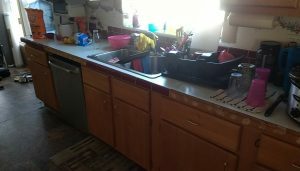 Old counter tops were tile with missing and broken tile in places. New counters are in and looking great. New wall tile our customer is installing will complete the look!